Reflect over the relationship between the composition and objective/message in the image. The format of the image is upright rectangular. In the image, you are able to see the full body figure shapes of the four people walking down the street, making it a large total. A large total means that the human(s) in an image is a part of the picture, along with the surroundings – and a part of the understanding of the whole image. The image is slightly asymmetrical. Blue Lines: Showing the symmetry of the picture. The people in the picture is mostly centered, but leaning slightly to the right. This is enhanced by the way the sun is shines, as the sunbeams hits the image more to the right than the left. Yellow Lines: The image clearly have some diagonal lines. These lines leads the image in the same direction as the people seems to be walking, giving the message in the picture a sort of an underline. The diagonal lines also makes you discover more than the center of the image, making your eyes wander. Red line: The sun is a natural focal point in the image at your first glance. With some help from the trees, the sun forms a natural circle in the image. 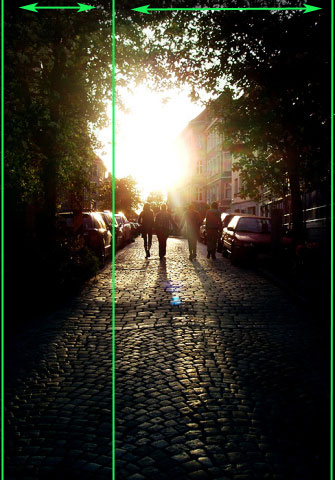 Green line: The image also contains a triangle shape, pointing in the same direction as the diagonal lines, and leading the same way as the people are walking. The image is also captured in the Golden Ratio – although I’m not sure if this was actually the purpose, as it’s not too obvious. The Golden Ratio = A line divided so that the smaller portion in the image relates to the larger portion, which again relates to the full portion in the image. As mentioned earlier, all diagonal lines along with the triangle is pointing in the same direction as the people in the image is walking – which is away from the viewer and “towards” the sun. The contrast of dark and bright in the image is created by the sun and the shadows. As the people are walking towards the sun, and away from the shadows, the image has a calm, happy feel to it. This is enhanced by the two people in the middle holding hands, which gives an impression of love. At first glance looking at the image, I was thinking; “these people must be heading into town for a night out or something”. After studying the image for a good while working on the analysis, I still have that feeling. This is an image of four friends (maybe the two holding hands are a couple) heading somewhere together to have a good, fun, happy time together, enjoying the nice weather.